The recent manifestation of exclusionism in Japan has emerged at a time of intensified neoliberal economic policies, increased cross-border migration brought on by globalisation, the elevated threat of global terrorism, heightened tensions between East Asian states over historical and territorial conflicts, and a backlash by Japanese conservatives over perceived historical apologism. The social and political environment for minorities in Japan has shifted drastically since the 1990s, yet many studies of Japan still tend to view Japan through the dominant discourses of "ethnic homogeneity (tanitsu minzoku shakai)" and "middle-class society (sochuryu-shakai)" which positions the exclusion of minorities as an exceptional phenomenon. While exclusionism has been recognized as a serious threat to minority groups, it has not often been considered a representative issue for the whole of Japanese society. This tendency will persist until the discourses of tanitsu minzoku shakai and sochuryu-shakai are systematically debunked and Japan is widely recognized as both multi-ethnic and socio-economically stratified. Today, as with most advanced capitalist countries, serious social divides occasioned by the impacts of globalization and neoliberalism have destabilized Japanese society. 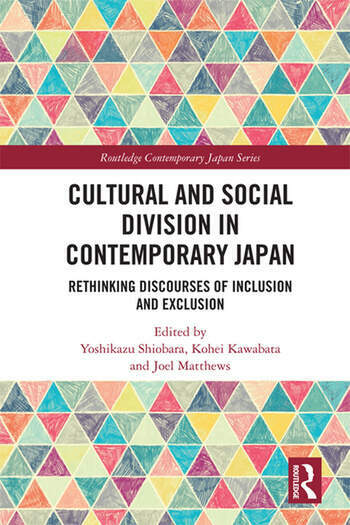 This book explores not only how Japanese society is diversified and unequal, but also how diversity and inequality have caused people to divide into separate realities from which conflict and violence have emerged. It empirically examines the current situation while considering the historical development of exclusionism from the interdisciplinary viewpoints of history, policy studies, cultural studies, sociology, and cultural anthropology. In addition to analyzing the realities of division and exclusionism, the authors propose theoretical alternatives to overcome such cultural and social divides.